Go ahead, mix and match! 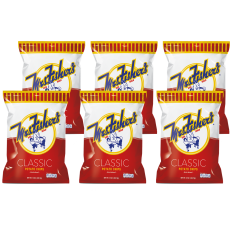 Select any 6 flavor/chip varieties in this 6 pack. Choose from Regular, Rippled, Barbeque, Dark, Black Pepper, French Onion, or our NEW Cheddar & Sour Cream flavor. Anytime is a good time for a familiar taste from home and they'll arrive fresh, just the way you remember them.